Smelling good and fresh is so important, especially in this hot and humid weather. For me, perfumes are great but they always fade on me and aren’t great solutions to smelling fresh throughout the day. Plus, you don’t just want to pile on fragrances on top of a stench – that never works because you’re not eliminating the cause of the odor. I’ve been recently coming back into the habit of spraying on a deodorant right after a shower and it’s a practice that I really believe everyone should get into. It can be so embarrassing to smell and you have something important to rush to in the evening like a date or meeting even if you can’t help it. 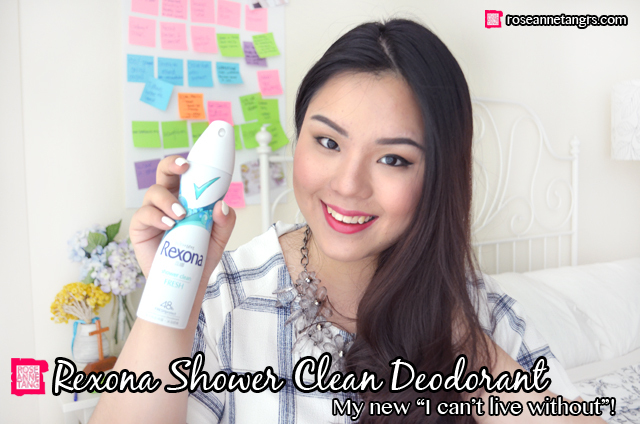 To always be reassured, my current favourite to do the job is the Rexona Shower Clean FRESH Anti-perspirant Deodorant. It not only eliminates odor but it controls sweat too – which something perfumes cannot do. 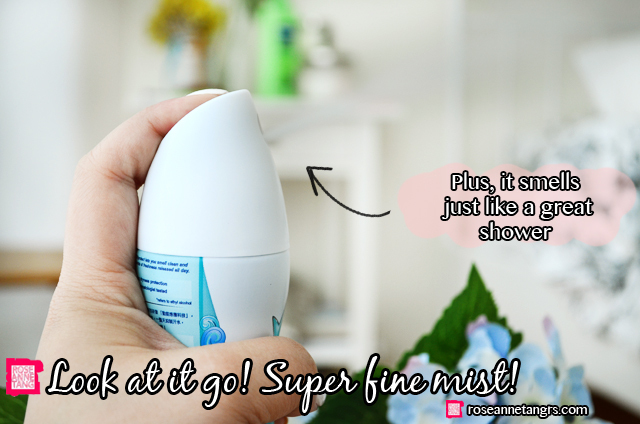 The Rexona Shower Clean FRESH Anti-Perspirant Deodorant comes in this gorgeous can that is skinny enough to bring with you everywhere even when you travel. It promises all day long-lasting dryness protection and is alcohol free and dermatologist tested. Most of all, the more you use it, the more it works which I find sets this deodorant apart from the rest. 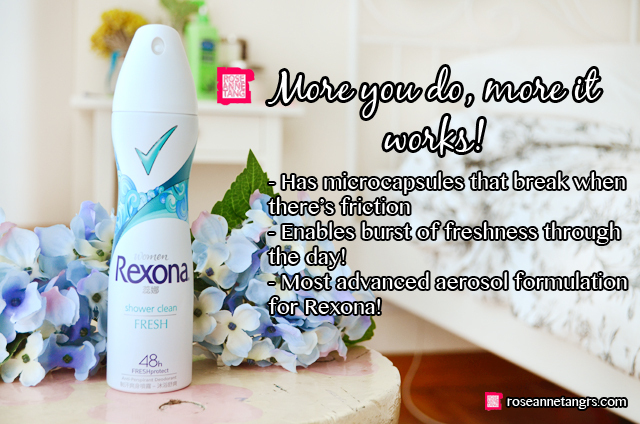 I found out that Rexona has created an advanced aerosol formulation that they’ve put into every can of Rexona Shower Clean that actually sprays little microcapsules that break when there’s friction. The friction can be caused by daily activities from walking to your office, moving about and even more intense activity like a game of tennis after work. This ensures that you are protected throughout the day and it’s really all about body-responsiveness. Rexona responds to your level of activity and gives you fresh protection as and when you need it. It’s called FRESHprotect technology and it controls sweat and eliminates bacteria too! The spray itself is a fine mist with a powdery feel. It’s no where near greasy and does not leave a build up at all. I prefer spray on deodorants more than sticks because they don’t leave any residue whatsoever so you can go about your day smelling good but not feeling sticky or greasy. I always use it right after my morning shower. It’s the best time to just take a second to spray it on before you get changed. Doing it immediately prevents bacteria in the underarm to return and it only takes a few minutes for the bacteria to come back after your shower! Odor is actually caused when bacteria and sweat mix together and body odor gets trapped easily in our underarms where there is little movement. We may not be able to smell it sometimes, but other people for sure can! Therefore, a shower really isn’t enough even for people who don’t sweat at all because it only takes a drop of sweat to release the odor! You need to spray on an anti-perspirant deodorant to keep you clean, fresh and dry all day long. It’s really all about passing the everyday freshness test and getting to do more with your life each day! 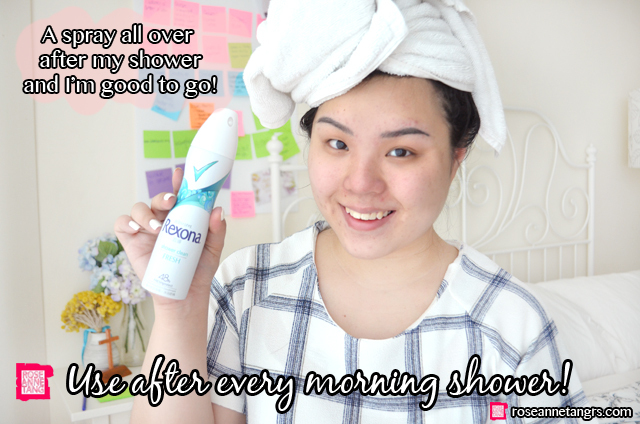 I just wanted to say that I really love Rexona. I’ve been using their products throughout my school days to keep me always smelling great. Body odor is my personal pet peeve and I do not like being a victim of it nor do I like being a cause. I used it every morning and I brought a can along with me to school in case after my shower I needed to use it again. 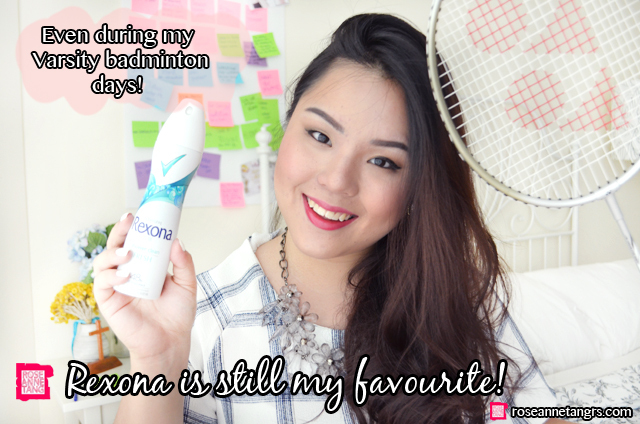 I never told you but I used to play badminton for school so Rexona was like my best friend through rigorous training. I always had a can of Rexona in my bag. 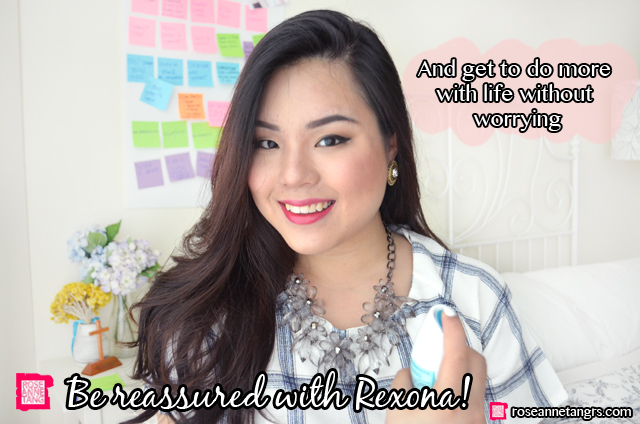 One last thing – if you want to try Rexona or you love Rexona as much as I do, you have to stay tuned on their Facebook page for monthly giveaways and Facebook contests! It is so easy to enter and consists of answering a question posted on their Facebook page in the comments section and 10 lucky contestants will be picked by the Rexona team every month to win exclusive Rexona giveaways! 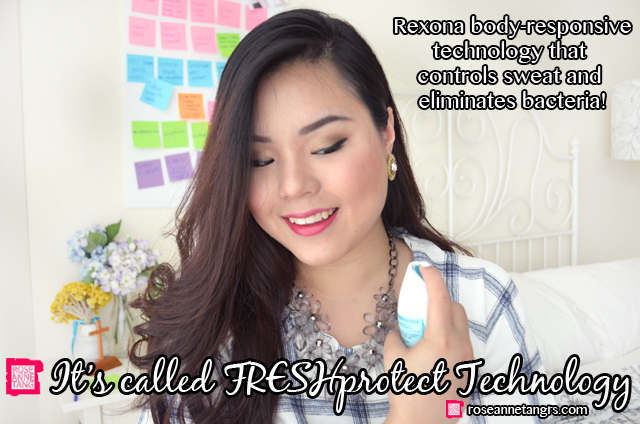 Join the July Facebook Contest here (http://bit.ly/RexonaStayFresh01). . Plus, stay tuned for the giveaways for the next three months from August to October too! Beauty Blogger Tag: Things You Probably Didn't Know About Me!